The treatment of humans with advanced cancer represents a major therapeutic challenge. One approach to treating metastatic cancer is immunotherapy, which can be classified into active and passive categories. Active immunotherapy refers to the immunization of the tumor-bearing host with materials that attempt to induce in the host a state of immune responsiveness to the tumor. Passive (adoptive) immunotherapy involves the transfer to the tumor-bearing host of active immunologic reagents, such as cells with antitumor reactivity, that can mediate, either directly or indirectly, antitumor effects. 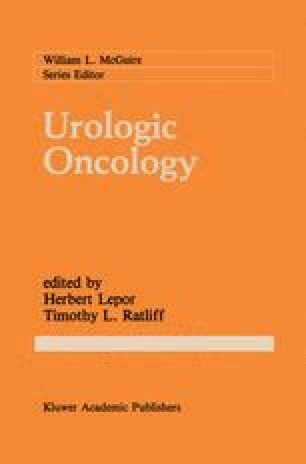 Most attempts at immunotherapy in the last several decades have involved active immunotherapy utilizing nonspecific immune stimulators such as bacillus Calmette-Guerin (BCG), Corneybacterium parvum, and levamisole, with the hope that a nonspecific increase in human reactivity would concomitantly result in an augmentation of the putative antitumor immunologic response of the tumor-bearing host. The very large number of clinical trials of both specific and nonspecific active immunotherapy of human cancer performed in the last decade were almost universally unsuccessful, and enthusiasm for this approach to immunotherapy has waned considerably. Passive approaches to immunotherapy have been rarely utilized in the therapy of human cancer because of the theoretic and technical difficulties that were associated with raising the immunologic reagents necessary to perform these clinical trials.